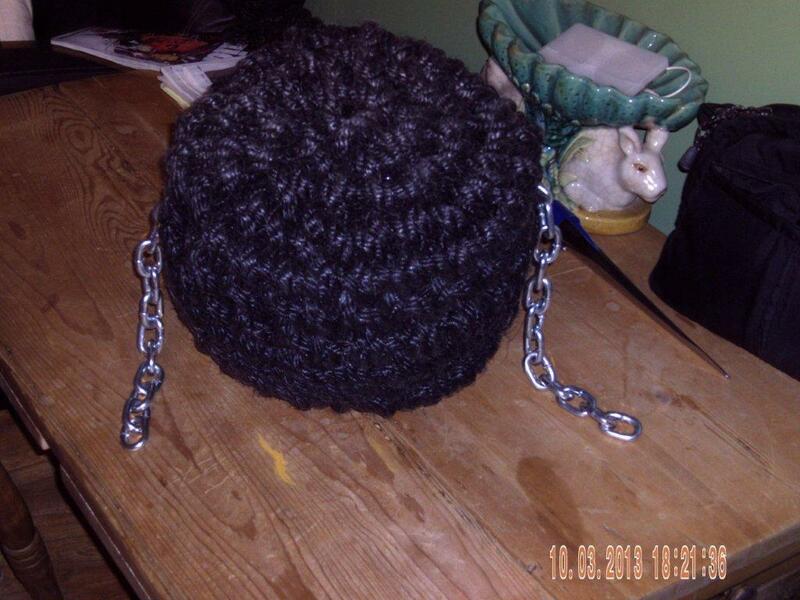 I have stayed away from the CanalWorld Forum for a long time. I know lots ofpeople who say that they read it every day but rarely if ever post, and I simply do not know how they do it. As soon as I log in, I read something that demands a response - whether praise, derision or reasoned argument - and I can not leave it alone. Even if I determine not to respond, the arguments are forming themselves in my head, demanding an outlet. Which only makes things worse of course as trying to engage in reasoned argument with the internet is a mug's game in 97.6% of cases (spurious statistic I just made up). So the only course of action to spare my time and my sanity is to go cold turkey; log out, wipe it from the computer's memory and stay away until the craving finally abates. And I have done this quite successfully. Jim on the other hand still indulges occasionally, which is how we knew that a big banter was planned for last night in the Navigation, Gnosall. As this is only a few miles away (one of those rarer cases of it being further bybroad than by canal) it would have seemed churlish in the extreme not to put in an appearance, so we did, renewing our acquaintance with a great many very sound, sensible and likeable people, including (but not limited to, because someone, no matter how worthy, is bound to have slipped my mind amongst all the Sunbeam), Smelly, Lonewolf, Victor Vectis, Little Else, Cheshire Rose, Postcode, Blue String Pudding, Tree Frog, Purple Fairie, Smudge, Alan Fincher, Catrin, Dyad, Alan [forgotten initial], Bazza, Madcat, the boater formerly known as Baldock and Lise, RWLP and Mrs Tawny Owl, and many, many more. Pleasingly, many of the more irritating forumites were not in attendance. All in all it was a splendid social event and a most enjoyable evening, including a music quiz with no music, which was novel. I did find myself promising that I would go back to the forum again... We shall see. Another little job completed - Chertsey's historic plaques in pride of place at last. The 1970 IWA rally on the Wey, 1973 NBOC gathering at Fradley, the re-opening of the upper Avon in 1974, and a gathering at the Black Country Museum in 1981. All topped off with a newly purchased but now historic NBOC plaque - from now on, new club plaques will say HNBC. Inside I have the commemorative plaques I've started to collect, strictly for gatherings that Chertsey has been to. Two Braunston key fob tags (they didn't do one last year, which was a great shame); last year's Droitwich gathering, and Retford and Worksop Boat Club from the year before, and our very first one, from Windmill End in 2010. I also have two BCNS Bonfire plaques - one which belongs on Bakewell, from when we went there with Aldgate, and one from last year for Chertsey, when we didn't go at all despite having registered. I'm not sure what to do with that one! Today we had a little play with the newspaper-log-making machine that we got in the Cats' Protection League shop in Stourbridge on Wednesday. It was brand new, in its unopened box - a hopeful gift maybe. Ever keen to discover new ways to get rid of old copies of the Guardian, we had, since Wednesday evening, been depositing them in a large bucket of water. A minor design fault becomes apparent at this stage, which is that the water squeezed out through the top of the insert has no means of escape and has to be tipped out - tricky whilst keeping the pressure up at the same time. Once as much water as possible has been expelled, the insert is removed, followed by the whole liner, now containing a brick of compressed newspaper pulp. This then has to be left to dry - I suspect that the manufacture of these things is an activity better suited to the summer months - although one would need to beware of sudden downpours, or you could have a right mess on your hands. How long they will take to dry out, and how well they will burn remains to be seen, but rest assured I shall report back as soon as I know. As you can see, we did also try to incorporate some old cardboard, which looks to have been rather less successful and is probably better avoided in future. I don't know whether you've been following the adventures of Lucy Belle (you really should) as Jemma the Dog and her intrepid crew of narrowboat novices tackle the Soar in flood and other obstacles between Pillings Lock and Lucy Belle's new mooring at Bugsworth. Such boldness deserves to be rewarded with Jasper's finest buns, so at luncthime we set off, pausing only to purchase said buns, for Handsacre, where we parked in the car park of the Crown, which was to be our rendezvous this evening. From there we set off for a much needed walk in the direction of Alrewas, whence Lucy Belle had set off (and, being from Burton, they can even pronounce it properly, whereas we stick with the tried and tested 'Old Walrus'). We'd gone about two and a half miles when we decided to stop and wait at Wood End lock. The weather was certainly much improved on the last few days, although everything's relative and it was still pretty damn cold. Quite a few (well, about half a dozen) boats were moving towards Great Haywood, but only one the other way. 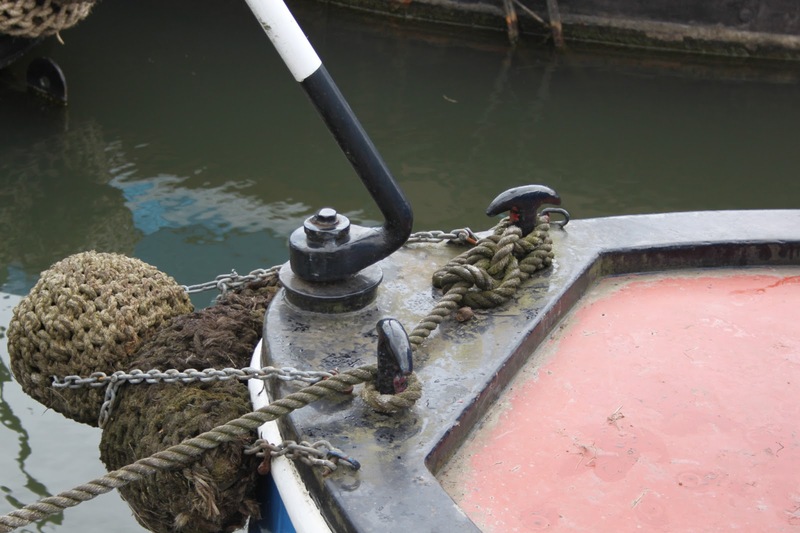 After two other boats, Lucy Belle appeared on the horizon, so after the lock we hitched a lift back towards Handsacre, passing Chertsey's old mooring at Kings Bromley Wharf on the way. The piece of ploythene sheet I attached to the guttering downpipe to discourage it from discharging into Chertsey's hold is still there, I was pleased to see, but wasn't surprised to note that no one else has taken up that particular mooring. On arrival at Handsacre we went into the dog-friendly Crown, but didn't find it particularly alluring. On paper (ok, on t'internet) there's not a lot to choose between this pub and the main alternative, the Old Peculiar - and the only available beer, Bass, gave no cause for complaint. But there was just a general atmosphere of not-quite-rightness, and despite their website's promise of fresh local food, no one was eating. So we moved on to the Old Peculiar, and you could tell as soon as you walked in the door that this was a different kettle of fish - warm, welcoming and busy, with every table reserved for the regular quiz, but they squeezed us in for a quick meal which was good solid pub food at a reasonable price. It did feel good to be back on the towpath and working the odd lock again I must say, even though I'm sure we wouldn't have been thinking that if we'd been doing it earlier in the week. 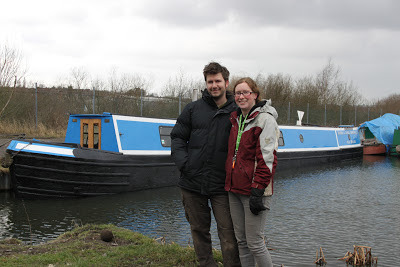 So many thanks to Jemma and her crew on Lucy Belle, and bon voyage to Bugsworth. Having decided to stay put here rather than brave the weather, we have been looking for ways to spend our Easter holiday (I having booked time off work for the purpose). Today we decided to revisit Stourbridge, where we had such a success in the charity shops last time, and this time to pay a visit to the various museums and studios commemorating and continuing the town's glassmaking heritage. The charity shops were a disappointment this time, yielding me only a nice little pair of red (Clarks) shoes - a good find, as it's a style I admired when they were in the shops last year. In an unheard of turn of events, Jim actually bought more than me, with some trousers and a new guest tent (so don't buy one, Dr Duct!) for the hold, plus a joint purchase, one of those devices for making logettes out of old newspaper. I've always wondered whether they worked, and now I can find out, for a fraction of the price of a new one. And then to the Red House Glass Cone, which as well as hosting a small museum and demonstrations of glassmaking, is home to a number of artists and craftspeople working in glass and ceramics and producing some really beautiful stuff. I particularly liked this cameo glass vase, although unlike many of the pieces for sale, it was somewhat out of my price range. We rounded the visit off with hot chocolate in the Red House coffee shop, which was also very nice, if somewhat empty on a day like today. We had intended to visit the Broadfield House glass museum on the way home, but as it was well past lunchtime, decided to leave that for another day. Tomorrow, some vaguely boat-related action is promised! For those of you who like weather forecasts, Jim heartily recommends Weatherweb. It is rather good, especially for longer term forecasts. As you can imagine, we have been awaiting each daily update with bated breath, it being the high spot of our day. After a madly busy week, I dashed down from Sheffield on Saturday to make the final preparations for setting off to Ellesmere Port. The original plan had been to leave on Sunday, but we decided that Monday would be ok, and would give us time to gather our wits and shop for provisions for the (ahem) four or five day journey. Jim has spent weeks getting Chertsey ready, cleaning, painting and polishing, servicing the engine (and painting that too) and after a busy half-semester at work I was itching to be boating. Over the last few days though it gradually dawned on me, as the snow fell in ever increasing quantities, the temperature plummetted, and worst of all, the wind whipped itself into gale force gusts, that the weather might be about to put a spanner in the works - not for the first time of course. I have had lovely times in the past boating in the cold and snow, well wrapped up. The time we moved Chertsey from Kings Bromley was one such, with the sun twinkling on the snow. Of course, on that trip we did only get as fat as Great Hayward before becoming trapped by the ice and having to abandon Chertsey there for seven weeks. There have been many times we have boated in pouring rain, and while not pleasant, it is certainly doable. But one lesson I have learned, and learned well, is that trying to boat in the wind, on a boat like this, is a recipe for misery and quite possibly disaster as well. Getting constantly blown onto the bank and stuck on the bottom is frustrating enough when the weather is relatively warm; when the ground is frozen and the wind Siberian, it hardly bears thinking about. Constant wind makes communication hard, dries out your throat and skin... In my book it is the very worst weather for boating, and I won't set off in wind now unless I absolutely have to. So, with the forecast for more of the same, and possibly even colder, until the weekend, and possible rain next week, we have very sadly decided not to set off for the Port after all. A small part of me (and a big part of Jim) feels that this is a bit wimpy, and we should battle through and savour the sense of achievement that would eventually accrue. But... let's not forget we are meant to be doing this for enjoyment; our livelihood doesn't depend on it and if it's more suffering than fun, there really isn't any point. So instead we are battening down the hatches, stuffing the cleverly shaped pieces of Celotex left by the previous owner into the window recesses, and hunkering down under multiple layers of bedclothes by night, and sitting by the fire watching a hotpot cooking away on the stove by day. The cancellation of spring has, I'm afraid, caused great inconvenience to our journey. Let's just hope that summer is not delayed as well. This area, on the starboard side just inside Chertsey's back doors, has needed attention ever since we bought the boat. The graining was flaking of, and, unlike that on the doors (by Ian Kemp) the painting wasn't really of a standard worth saving. Normally, I'll save anything if I can, but I had a better idea for these panels. Chertsey came with a very small collection - four, to be precise - of rally plaques, dating from between 1970 and 1981. They are going to be displayed in the lower section. At the top will go my big, heavy NBOC plaque. Following the earlier name change from Narrow Boat Owners Club to Historic Narrow Boat Owners Club, the plaque wasn't changed (I suppose it was hard to fit in an extra letter); however, following the recent change to Historic Narrrow Boat Club, a new batch of plaques, reading HNBC, have been ordered. Naturally I snapped up one of the old ones while I could and it will have pride of place here. The plaques will be mounted onto a crimson background, while the framing will be cream, to match the back doors. Many thanks to Jim of course for painting it in my absence. Nearly ready for the off now. Jim has refitted the cutter on Chertsey's engine pipe ready for the trip to the Port next week. I don't believe we ever damaged this one on a bridge; it was held on with bolts that were rattling loose, and the idea on a nut down the exhaust didn't appeal, so we took it off for that reason. Apologies to those of you who have already seen this in the HNBC newsletter, but maybe those who haven't can shed some light. Shortly before Christmas, I came across this picture in the local Oxfam shop. 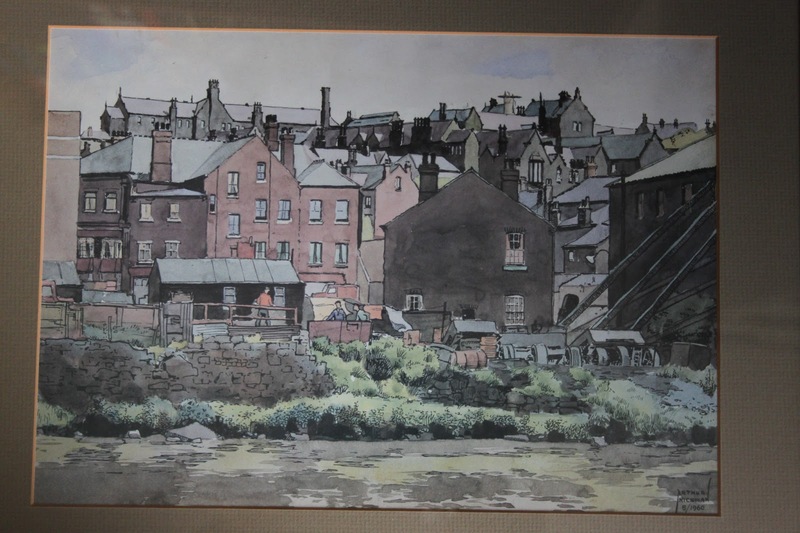 Unusually, for Oxfam, it was very reasonably priced, and I bought it - although not without running home first to look up whether the artist was local, and thus whether it might be a local scene. 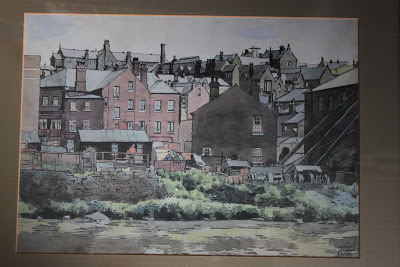 The artist, Arthur Hickman (who died in 1987) was in fact from Rotherham, and the general consensus of those I have canvassed is that this is likely to be a scene of that town, but no one can pinpoint exactly where. It was painted in 1960. I notice from the time stamp that they're from quite a while ago, but pretty nonetheless. Note the warm patch across Bakewell's cabin top! Now I've been here six months, here are some reflections on why I like Sheffield so much. 2. People in cars stop to let you cross side roads, even when it is totally unnecessary, as if they continued to the junction you could easily cross behind them. This used to confuse and annoy me, but I have now come to see it as just another example of northern loveliness. The only problem is, when I go back down south I will get run over. 3. It is not necessary to scrub the shower screen with vinegar. 5. Buses I can (just about) understand, and actually use. 7. A council that actually does stuff (even if that doesn't include putting the right links on their website), rather than try to spend as little as possible. Other noticeable things about Sheffield and the north are that people smoke a lot more, and shamelessly, and finally, the most surprising thing is, in a city of arcane traffic schemes, tramlines and bloody great hills, how many people cycle. 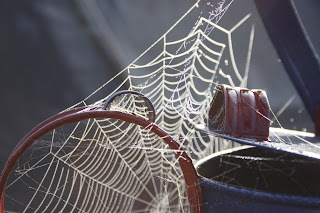 If I'm going to start blogging frequently (if not regularly) again, I'm going to have a go at doing 'Silent Sunday' posts, which Nick explains here. This isn't one, because it has words, and the photo wasn't taken within the last week, but let's see what I can do from now on. 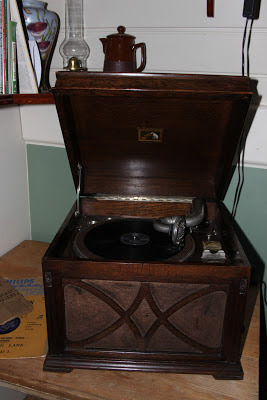 I was always rather envious of FMC Dove's wind-up gramophone, used to such good effect to accompany their videos of the Braunston parade, and generally create a suitable atmosphere at historic boat gatherings... I never thought I would find one for Chertsey, at least not one in working order at an affordable price. But as you can probably guess, given that I'm writing this, I did. It was in the window of the antiques shop in Penkridge, and we bought it for ninety pounds, complete with a 78 of 'Polly Perkins from Paddington Green'. It does work remarkably well - and it's loud! with no volume control. As you can see, it doesn't have a horn - it is in fact one of the last and best wind-up gramophones made, the HMV 130 table top model (so not really intended to be portable) of which thousands were sold well into the 1930s. Apart from some slight damage to the mesh at the front, it's in excellent condition and seems to have been quite a bargain. Near me in Sheffield is an Age UK bookshop (of which more later) which has a massive pile of 78s for sale at £1 each. 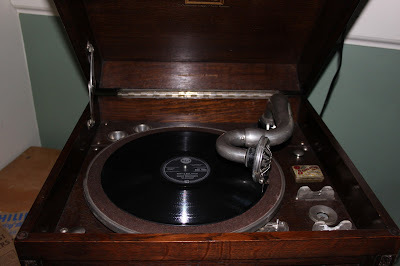 I spent a long time browsing and eventually selected four, including Winifred Attwell's Black and White Rag (familiar to my generation as the theme music to Pot Black) and Harry Belafonte singing Mary's Boy Child. So listen out for it when we're next at a gathering! I've talked on a few occasions about the Union Canal Carriers' 'window cloths' which I was extremely pleased to have bought for four pounds at the tat auction in Droitwich last Easter, but I don't think I have ever shown them in use. There are two of them, each four feet wide by about eight feet long. 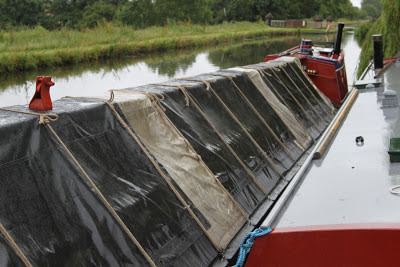 They are made of translucent plastic reinforced with a pattern of woven fibre, and they have an eyelet at each corner. They go over the top plank and over the side cloths and the eyelets attach with rubber bands (cut from old inner tube) and hooks to the gunnel rings. The top cloths then go over them, and can be folded back (although in this picture we have left a gap between the top cloths instead). Once tied down, they look quite smart. They certainly make a difference on the inside, where they really do look like windows, nearly three foot square. 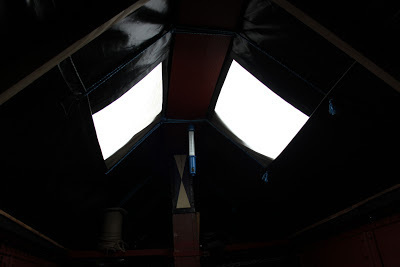 Instead of an unusable pitch black hold, we have a big well lit space, so much more useful and welcoming. Hot off the email, latest photos of progress on the cants! Credit to Jim of course, for the photos, and most importantly, the painting! It is true that the restoration of a historic boat is never finished - only that perhaps, at some point, it becomes maintenance. Chertsey's front cants and breastpiece were replaced in 2011 (I think! ); or rather one cant was; the other, which appeared to be made of mahogany, was still sound so we cleaned it up and put it back. 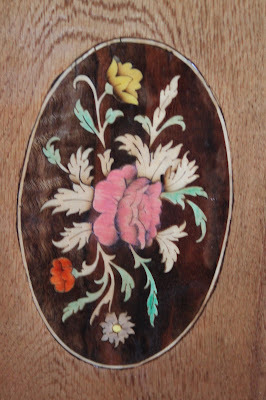 The new pieces were made of oak, and looked splendid in their shiny blue paint. As early as last autumn however, I noticed that the paint on the new cant was cracking, and knew that this would need attention quickly before water got trapped underneath the paint. Jim has set to now and started work on it. He'd never been happy with the primer originally used - oak is a difficult wood to get paint to adhere to - so rubbed it back to the bare wood and primed it again (if I could remember the primer he used I would tell you, but it will no doubt come up later). Then this week he undercoated it, and it snowed. Hopefully it will be blue again by the time we set off to the Port, but it is very much in the hands of the weather. While he was about it, he also rubbed down Bakewell's front cants. These seem to be in good condition, with no rot - but aren't oak or hardwood. If I had to guess I'd say they looked most like elm. There are some wide cracks (especially on the other side, not in the photo) that might need filling before they're painted. The idea is to do bits of Bakewell as we go along, in tandem with Chertsey. The colour scheme will be the same but possibly not the actual livery. In practice of course, Jim is doing nearly all the work while I sit at my desk in the warm and only turn up for the fun parts. The big job on Bakewell is still the back cabin, of course, which was meant to be done last summer but there was never a long enough dry period. I have made a number of new friends at work here in Sheffield, and sometimes they like to go to a 'coffee shop' to drink frothy hot milk with a little bit of coffee in it. As hot milk comes second only to scrambled eggs in the litany of Things I Can't Stand, and black coffee, let's face it, is something you really have to be in the mood for, I tend, in a triumph of hope over experience, to order tea. I used to think it was a good sign when somewhere offered a pot of tea - and maybe once it was. But now it seems dinky little pots are a must-have for any establishment with pretensions to class. The tea they deliver is usually derisory, however, for one simple reason. They take a two-cup pot (wouldn't be any point in offering a pot otherwise, would there) and they put a one cup teabag in it. Result: lightly straw-coloured water. To add insult to injury, this is then usually presented with a chunky, wide, shallow cup in which the 'tea' instantly goes cold once poured. So I have started a one-woman campaign (the Campaign for Proper Tea Rights) to get two teabags in a pot at - and this is the important bit - no extra cost. My reasoning is that if the menu offers tea at a certain price, then tea, not gnats' piss, is what it should provide at the stated price. The cost of a teabag - even a half decent one - is on my estimation approximately 1% of the cost of the entire coffee shop tea experience, so this is not too much to ask. So far I have had a 50% success rate (i.e. one out of two). In the successful case I did in fact get a whole second pot, as I only realised how weak it was after it had been made. The offer to immerse a second bag in the no-longer-boiling water was politely declined, and I pointed out how marginal the cost was, and got a reasonably decent pot the second time around, albeit still with the obligatory 'Instacool' cup. The second time, I made the mistake of asking - rather forcefully - before the tea was made, and while I got the extra bag, I suspect I was charged for it. And they quite possibly spat on my oatcake as well. Now, you (yes, you, Starcross Jim) may well be sitting there shaking your head and saying, why all this fuss about teabags, when you can only make a decent pot of tea with loose leaves. Well, I accept that the very best, the apogee of tea, is probably that made with one's favourite blend of loose leaves, in a good, clean, warmed pot, and served in best bone china. But leaf tea is very easy to bugger up too, and to be honest, a good quality teabag (I'm favouring Yorkshire Gold at the moment) is at least more reliable in the hands of a barista. Certainly, give me a teabag any day, plonked in a mug, doused in boiling water, stirred, left, stirred again, then milk added, than some of the attempts at leaf tea you get served in cafes. Because at least in a bag, the tea has room to move and to brew. Places wanting to serve trendy leaf tea have these pots with the little strainer thingummy in the middle which is sometimes packed so full of tea that the middle isn't even wet. Result, once again, gnats' pee. (Solution: tip the contents of the strainer into the pot, give it a good stir, let it brew, then pour it through the strainer into the cup.) And that's if the stuff is tea anyway - the places trying really hard to be trendy seem to use a mixture of multi-coloured leaves and twigs and bits of bark, perhaps not realising that there's a reason tea leaves are traditionally chopped up very small. The sad thing is that most people who think they drink tea, actually want to drink lightly coloured water with some milk in it; either that or they don't care. I have the same opinion of people who ask for weak tea as Jay Rayner has of people who ask for their steaks well done - they simply don't deserve to have it at all. Likewise (I have seen this said by one who should know), most people who think they are terribly sophisticated about coffee really just like slightly coffee-flavoured frothy hot milk. Of course the place to go for a good cup of tea is not a coffee shop, or even a 'tea shop', but a proper old fashioned caff where it will be served in a white Pyrex mug and either poured from a big (but fresh!) pot, or made with a teabag and super-heated water. Sadly though I haven't found one round here yet. And I very much doubt if my colleagues would accompany me there if I did. Twice a year, Brian on Alton runs a fender-making course at Audlem Mill. Jim has long quite fancied learning this craft - and I have long thought it would be a very useful skill to acquire, but not for my delicate little fingers! - so I hatched a plan to book him into one as a birthday present. His birthday's at the end of September, so the autumn course would be perfect. I put it in my diary to book last week, but when I rang - fantastic for Audlem Mill and Brian, very disappointing for me - they were fully booked for the autumn. 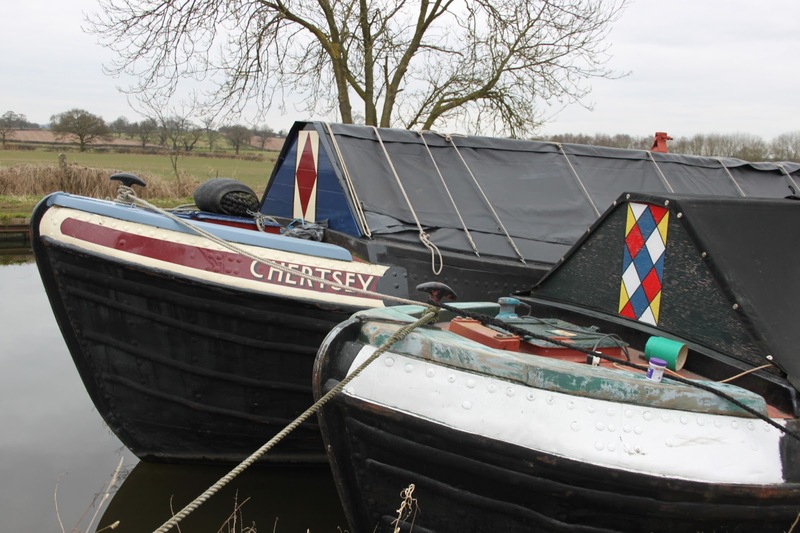 I had a brief chat to Peter at the Mill, about Chertsey, which he remembered from our brief visit passing through en route to the Port in 2011, when the boat was still in primer. We'd been booked in to the Audlem Festival of Transport last year, but had to cancel when I realised that it clashed with the East Sussex Youth Orchestra's* one annual concert - with Sebastian leading the double basses, and Izzi the cellos, we really can't miss that. So the Audlem Mill gathering is crossed out of the diary until they get too old (although bass players, being in such short supply, rarely are). So I promised to drop by again on our way down this year and show Peter Chertsey in all its painted glory, and he promised to let me know if there was a cancellation for the autumn course. A few minutes later he emailed to say that he hadn't thought to mention, but there had been a cancellation on the spring course, the weekend of March 9/10 - would I by any chance be interested in that? I certainly was. Having checked with Jim that he was free, I booked it up. 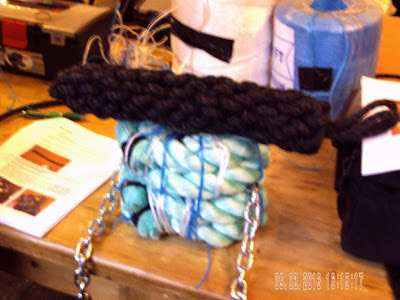 Not having been there myself, I can't report on it in any great detail, but Jim thoroughly enjoyed it, and came back with a side fender (and enough materials to make another one, if only the cat would stop helping) and an absolutely fabulous looking button, with a proper rope core. I have impressed upon him how important it is to keep practising, so that he doesn't forget how to do it. *Website designed by Sebastian, who probably also provided most of the viola jokes. Yesterday I took a trip to Langley Mill. This trip began with me walking down to the station and getting there in plenty of time to enjoy a pint of beer and a packet of crisps in my new favourite waiting room (see yesterday), which was most pleasant. Then, less pleasantly, onto a Northern train which smelt of sick (either this is a corporate scent, or I was on the same train coming back), then, from Chesterfield onwards, a rather nice rail replacement bus, which actually made for a more enjoyable and interesting journey. 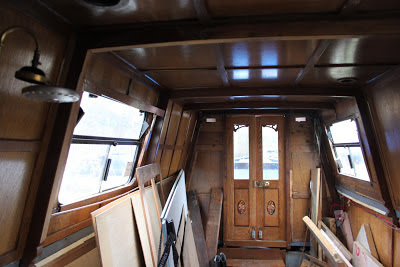 No matter how big or interesting a boat is (and Willow is both, being built a full 72' long and to an unusual design - read more on Amy and James's blog), a guided tour doesn't take long, especially when the only item fitted is a rather gorgeous and massive enamel stove. 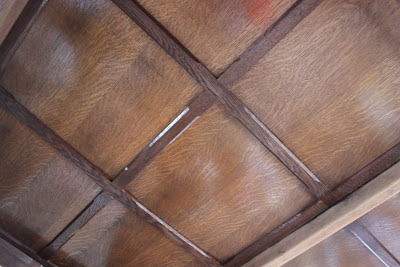 There are many things to oooh and aaah at, however, in particular the ornate woodwork, all executed in oak, and the sheer amount of space. I quizzed them about their plans for the layout (but will let them reveal that as it happens) and for getting back to Cambridge, where Willow will be their home (exciting and I look forward to reading about that as it happens over the Easter holiday). Then I drank tea and ate cake and generally got in the way until it was time to catch the bus back to Chesterfield again. Before leaving of course, I took lots of photos, and here are a few highlights of Willow for your delectation. I have to say, it looks as if Amy and James have done really well, and I don't half wish them luck with the fitout! It's going to be quite a job, but what a fantastic boat they'll have when it's finished. And its distinctive Severner not-dollies. So I have a very nice day out on Sunday - thanks very much to Amy and James for allowing my to take up some of their valuable fit out time. Amy walked with me back to the bus stop, and the coach arrived almost exactly on time (which I thought Starcross Jim might be interested to know, if no one else). On the way back I had the coach to myself as far as Alfreton, which was rather nice, although a perfect day was slightly marred by my very carelessly leaving my lovely woolly mittens on the coach going down. If one believes the way young people are presumed to speak these days, then 'awesome' is a much over-used word. I, however, mean it. There is a thriving real ale culture in Sheffield. Most pubs sell it, many have some idea about it. But still, I hadn't yet found one I really liked. There's the West End, on Glossop Road - handy for an after work drink with colleagues. But never more than two beers, and last week, none at all! Loudish music on the radio, no food now (though it used to be quite decent) and a strange combination of a half dead feeling and a high student quotient. The York in Broomhill - somwhere I've vowed not to go again. Way up its own arse with seriously overpriced mediocre food (soggy chips may be forgiven once, but never twice) and know-all young bar staff who were extremely sniffy about taking the sparkler off. Also near me, the Fox and Duck, and before I moved, the Nottingham House. While both served real ale, neither seemed to have any atmosphere, the latter being a hangout for students, and sporty students at that; the former it seems looking through the window, for TV watching unemployed people. Better bets have been the Bath Hotel, off West Street somewhere, where I've been just the once but it seemed very promising - trouble is, it's a bit of a way from home and, unless I'm teaching down that way, work - and the University Arms, which would have been my favourite fallback until last week. OK food, a good range of beer and staff who know about it - no sparklers, so it's not obligatory even up north, although they do tend to pull it with a degree of violence that produces a similar effect. Owned by the university, it has a high student quotient, but I suspect that these are students who seek it out for its special qualities. I know I should get on the tram and head down to Kelham Island, where, incredibly, I still haven't visited the Kelham Island Tavern (although I have, thanks to Adrian and Linda, been to the legendary Fat Cat). But that's more a day trip than a quick pint. Last week I was introduced by Sandra to two new establishments. Firstly, the Old House on Devonshire Street, in the painfully trendy quarter where people go to buy artfully distressed stuff. The Old House itself is a bit like that - I was offered my pint of Moonshine in a quaintly retro dimpled jug, and it was plonked not onto a sopping bar towel, but a folded serviette, but it was nice enough, and a good place to head if you're into fancy pants European beer. But not the best... That was yet to come. After an enjoyable Indian meal in Aagrah, we headed towards Sandra's train home, and the Sheffield Tap at the station. Now that was truly awesome. The Sheffield Tap, I subsequently discovered, is run by the same people who own the Euston Tap, also housed in a former railway building, and where I had my Farewell to Birkbeck party. The Euston Tap is nice enough, but completely modern inside, the building having gone through many previous incarnations including other bars. The Sheffield Tap however is housed in the station refreshment rooms and first class dining room, opened in 1904, and which were shut up and used for storage from the 1970s onwards. There are two main rooms, the second of which opened only very recently, and houses the pub's own microbrewery where craft brewers can come and play. These rooms have massive double height ceilings, with clerestory windows (or something similar) every inch of which is covered in tiles - I would say faiance if it was outdoors; I suppose it's the same inside. Mostly cream coloured with occasional coloured patterns lower down, and fabulous mouldings. The bar is mahogony, the fittings brass, the tables polished copper, the floor, in this last room, terazzo. I didn't count the beers; at least half a dozen ales, including a good showing from Thornbridge (pint of Jaipur - the perfect way to round off an evening. I got a cab home.) Plus of course all the scented, fruit flavoured foreign stuff you could shake a stick at. No music either, just the echo and jangle of conversation in the massive space (there are smaller, low ceilinged rooms too if that's what you prefer). It inspired the same awe in me as a Victorial church or technical college; both the idea of its original incarnation as the epitome of aspirational rail travel, and maybe even more so, in the dedication and vision that it must have taken to restore it. The best way to get a sense of it is to go to their website and just watch the slideshow. The person who commented on Beer in the Evening that the beer was ok, but too expensive, 'and there are plenty of cheaper real ale pubs in Sheffield' was surely missing the point. Cheaper still to buy a few bottles and drink them in your garden shed, but these surroundings a something I would gladly pay a premium for, especially when you can appreciate just how much the restoration must have cost. I am determined to give this worthy venture all the support I can! PS There is also a York Tap, again at the station, which I look forward to checking out. Shortly after I started work here, I was approached by one of my new colleagues, Sandra, who was about to buy a boat. The boat, to be called Lucy Belle, has been bought, and it has a blog which I am very much looking forward to following, so I have added it to the blogroll, and I hope you enjoy it too. Good luck to Sandra, Stuart and Jemma the dog. 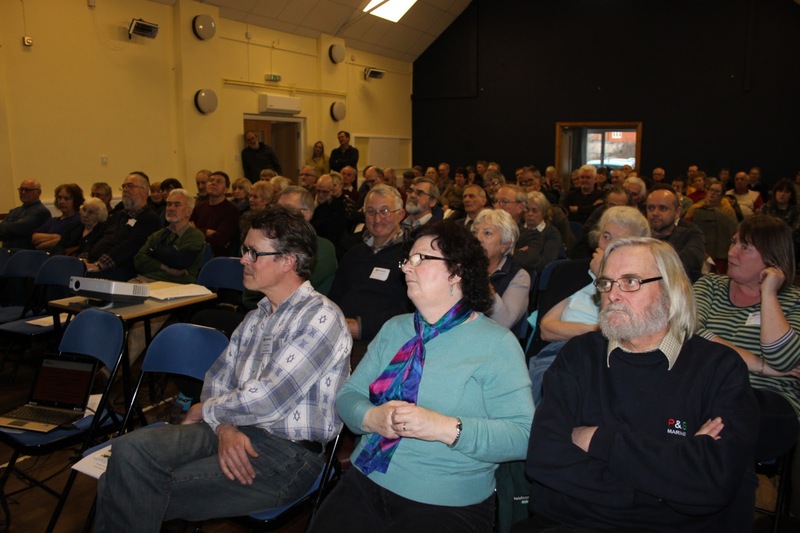 For the Annual General Meeting of the Historic Narrow Boat Club, held at Napton Village Hall (a rather good venue, with plenty of space, a committee room, kitchen, conservatory for the shop, and car parking - the only drawback being lack of public transport links). The spring AGM is one to two big HNBC gatherings held each year - the other being the 'November Social'. At each of these meetings, there is a guest speaker, tea and cake, and the opportunity to catch up with fellow lunatics historic boat owners. But the spring meeting has added AGM! Which as you can see is always very exciting. This includes the presentation of the Keay and Hemelryk awards for the most improved wooden and metal boats of the year respectively. This year the winner of the Keay award was Hazel, and the Hemelryk Admiral. Interestingly, the Hemelryk trophy is mostly wooden, while the Keay trophy, a somewhat battered rosebowl, contains no wood at all. This year's speaker was Tony Stammers, CRT's Head of Health and Safety. I've written a long article about his talk for the HNBC newsletter, so I don't want to scoop myself here, but maybe I will whet your appetite by saying that he won a lot of people over by appearing to talk a great deal of good sense and showing a real understanding of our concerns. Then of course (talking of the control of substances hazardous to health), there is the Tea. In previous years this has been of a legendary awfulness, being that worst possible combination of weak and stewed. This year I have to say that, while it wouldn't win any prizes, it was recognisably tea, and that is an achievement worthy of recognition, so a vote of thanks to Annie, Ros et al. The fruit cake was very nice too. Right. Make or break time for the blog. It's coming up for seven years since I started my Warrior blog, and never, not even in those early months, have I been so poor at updating it as I have been in the past six months. I really don't know why - it can't just be the change of job and of location, because that's happened twice before since I started blogging. It's not that life has got that much duller; OK, it's been winter, and I'm a long way from the boat, but again, that's hardly unprecedented. It's not that I've been too busy, nor that I have nothing to say, either. There are no negative reasons; nothing that has prevented me from blogging. I can only say that I just haven't felt sufficiently strongly motivated to do it. I've been engaging with the internet as a whole a lot less in recent months. I retired from CanalWorld well before Christmas, have only popped back once, very briefly (in the hope of discovering that Chertsey was made of Sheffield steel, but it was not to be), and I'm not missing it. I mean, I know there are things I'm missing out on by not looking at it, just as there are with TV, but in both cases I just can't face engaging with the whole thing just to avoid missing one or two nuggets. Seven years is a long time. For a blog, it's pretty ancient. Granny Buttons (after a lot longer) has retired from the fray; many others, less long lived, have been and gone. 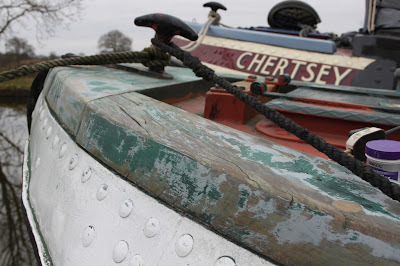 But Warrior/Chertsey has been going for nearly seven years, making it, even if I say so myself, one of the longest established canal boating blogs. It almost feels as if that in itself is a reason to keep it going. And, as the original title of this post was going to be, 'tis the season - starting with the HNBC AGM last Saturday - when we really start thinking about boating again after the winter. Indeed, in less than three weeks we'll be doing it again, as we head off up to the Port for Easter. Jim is already hard at work getting Chertsey ready whilst I'm sitting here at my desk in Sheffield. There's that to talk about, the AGM, the Lucky Ducks' new boat, and Jim's birthday treat this weekend... not to mention my latest Campaign for Decent Tea.